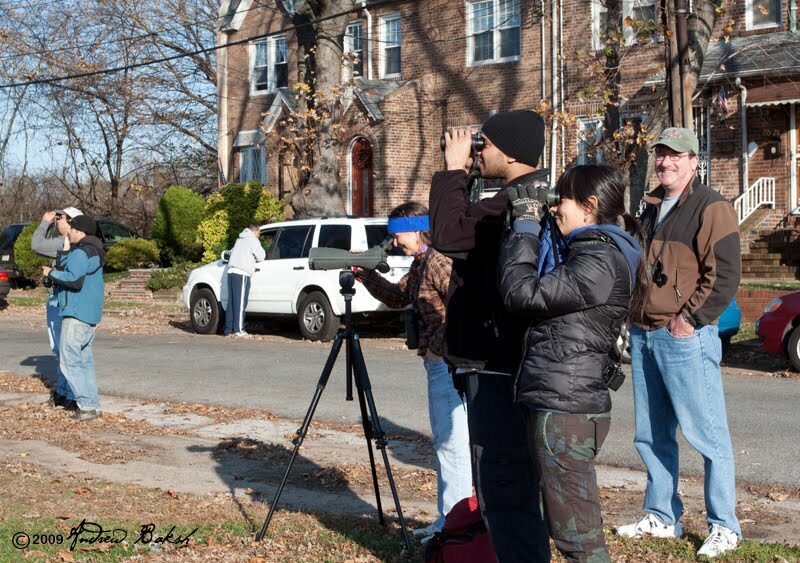 On Saturday November 7th, I joined my friend Howard Fischer for some birding out in Staten Island. 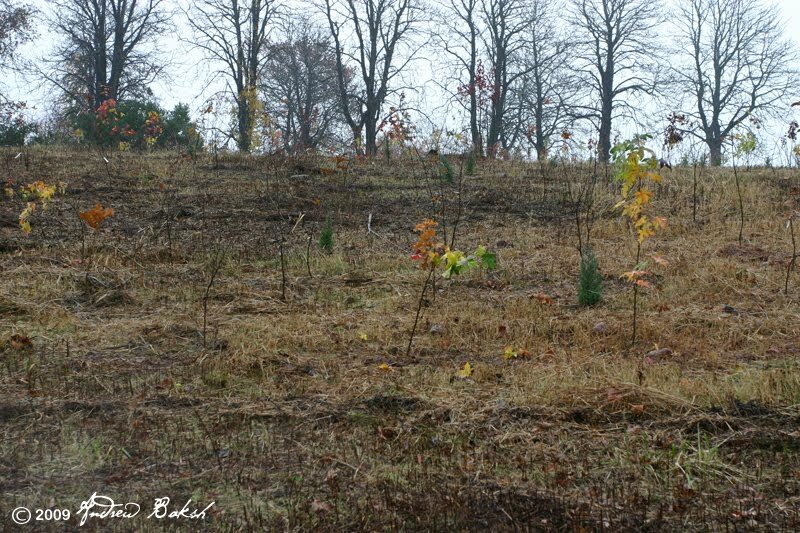 My first stop would be Mount Loretto; a place I had not visited since participating in the NYC Million Tree initiative with NYC Audubon, back in November of 2008. After arriving at Mount Loretto, I headed in to meet up with Howie; on my way in, I picked up a couple of Eastern Bluebirds working the field to my right. Unfortunately, I could not get Howie on them as he was on the other side of the field and that was the only Bluebird sighting for the day. 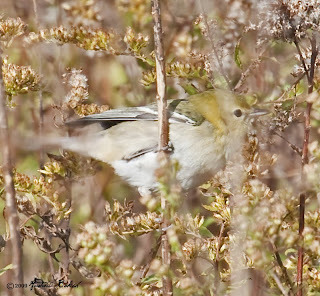 By the time I met up with Howie, I had already tallied another 8 species. We decided to do a little sea watch out into Raritan Bay to look for any Grebes and other species that might be lurking nearby. That was not as productive as we would have liked, but we did add both Common and Red-throated Loons and a few Gannets way out along with some other species. As we continued up the pat towards the Ranger’s quarters, I spotted a warbler flitting around near a clump of Virgina Creeper. 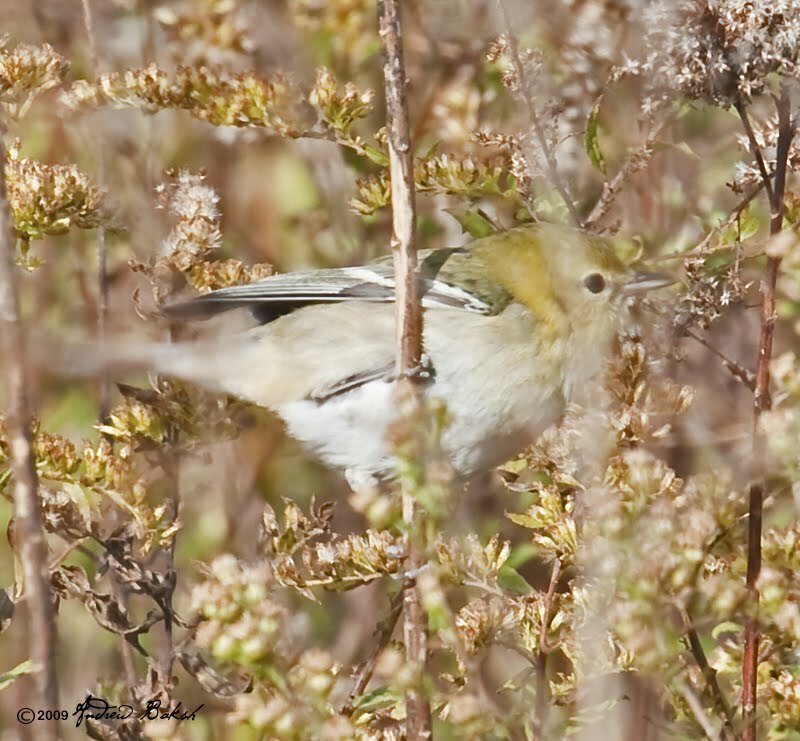 It flew into a patch of Goldenrods where we got a better look and identified it as a Male Blackpoll Warbler; a late one for this time of the year (not sure what the record is for Staten Island). We tried to get clear open photos, but the bird was not too cooperative and soon we left it to continue its foraging. We headed back near the field by the parking lot and visited the first of two ponds that are connected by a small creek. On our way to the pond we saw Swamp Sparrows, American Kestrels, Cooper’s Hawk and a Downy Woodpecker. At the ponds, we picked up Hooded Mergansers, Black Ducks, Northern Shovelers, Canada Geese and Green Winged Teal. 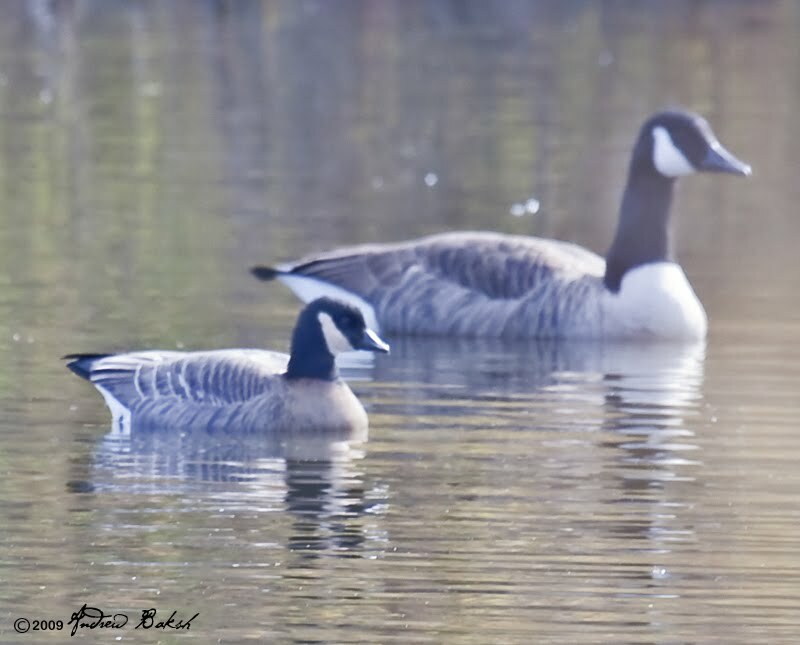 We had left the ponds heading to look for the reported Cackling Geese, when Howie spotted an Adult American Bald Eagle soaring over the church; the Eagle caused all the Geese in the fields across the road to take flight and they headed into the ponds. 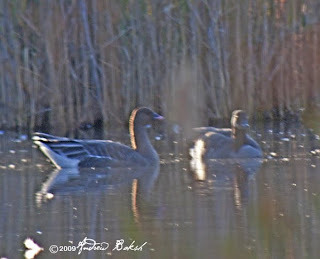 We headed back to the ponds in the hopes of finding the Cackling Geese and we did. 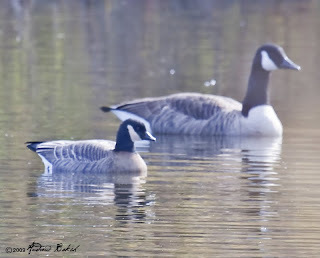 One bird looked like a typical "Richardson's" Cackling Goose, the other dark-breasted bird is POSSIBLY an example of B.h. minima? 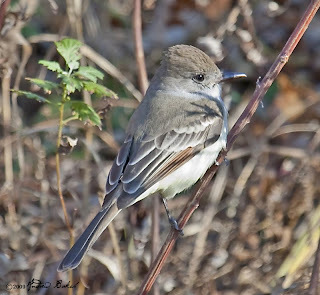 I am sure the Staten Island birders are having quite the discussion on this as Howie indicated. We left Mount Loretto and headed for the Great Kills area. 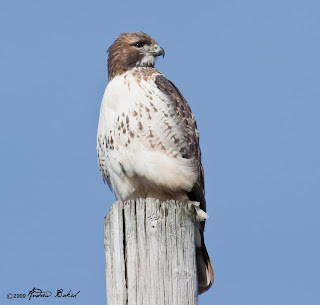 Along the way we spotted a Red-tailed Hawk on one of the roadside light poles and pulled over for a few photos. We continued to Great Kills and birded there for a bit, but it was quite slow. 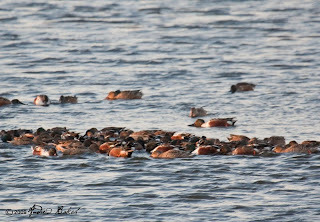 Howie left shortly for other commitments and I continued to bird an area called “The Flats”, where I picked up American Wigeons, Buffleheads and an Osprey fishing quite close to the shore. Leaving Staten Island I headed back to Queens, first stopping at Plum Beach in Brooklyn for a bit of birding. It was rather quiet birding though I enjoyed looking at the large numbers of Brandts milling around, which was well over 500. 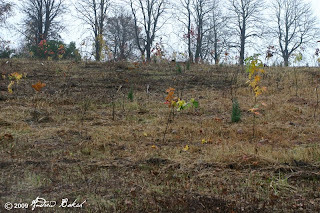 Sadly, I also observed behavior that bothered me given the importance of that area to wildlife. Beach goers with their dogs off their leashes and several times the dogs playfully ran at the Brandts that were feeding close to shore. In another instance, I observed Jet skiing close to an area that had Sanderlings feeding that took off once the "Yahoo" got close. I am not sure why NPS cannot enforce the rules that are in the books at this area. I helped NYC Audubon with a Shorebird/Horseshoe Crab monitoring project this past Spring and this site was designated as important to migrant shorebirds. Why then, is there not more monitoring done to safeguard the migratory species that use the area is beyond me. 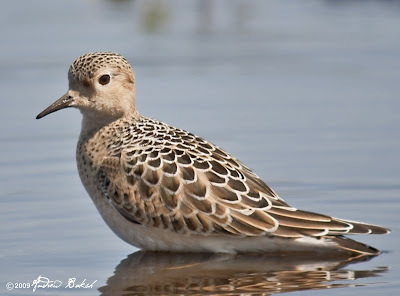 Here we are as birders vying for looks at shorebirds all through their migratory period. In NYC, during the shorebird season birders anxiously await any breaking reports of any shorebird rarities at Jamaica Bay. Yet, in some countries, these same birds are hunted, with thousands killed every year. Yep, no need to rub your eyes, "Hunted". In a country notorious for this activity a small step in the right direction was taken with BirdLife International leading the way with support from local conservationists and ex hunters. Read on about the 'No-shooting' shorebird refuge established in Barbados. Thanks to alert birders, Rudy Bedia, Richard Aracil and Heidi Lopes, an Ash-throated Flycatcher was discovered in an unlikely area - a vacant lot in Queens NY. Though, when one really thinks about it, maybe...it was in the right place making me wonder how many such goodies we are missing. 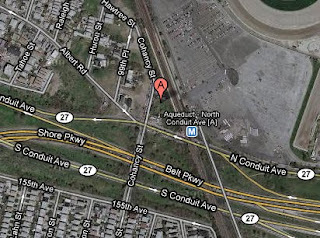 I was at Jamaica Bay Wildlife Refuge co-leading a walk with my friend Don Riepe when I first learned about the bird from Shai Mitra who called to alert me about the find and pending report; The walk was coming to a close, so I grabbed a pen and took some notes such as street crossing, exits - anything, that would help me pinpoint the location, keeping in mind that Shai was relaying what he was told. Shortly after my conversation with Shai, I got a call from, Gail Benson, who was with Tom Burke in New Jersey - I indicated to them that I was gathering intelligence (I like saying that...it sounds so cool :) on the whereabouts of the location. From then, things just evolved. The power of technology was on full display as birders used cell phones and GPS systems to coordinate and navigate their way to the area where this bird was found. When I got there, the three birders who had reported the bird were just leaving; I chuckled at the incredulous look on their faces when I pulled up and asked if they were the ones that reported the bird. They could not believe that I had received the information and gotten there that quickly. Such, is the power of technology coupled with friends who were willing to share information. Rudy, Richard and Heidi displayed true altruism by getting out of their car and returning to the location where they had the bird in an effort to get me on it; they ended up staying for a few more hours helping to get other birders that arrived later to get on the bird. Not long after I got there, I was joined by Seth Ausubel and we both got on the bird with outstanding looks. While Seth called Tom Burke, I called Shai who was on his way. 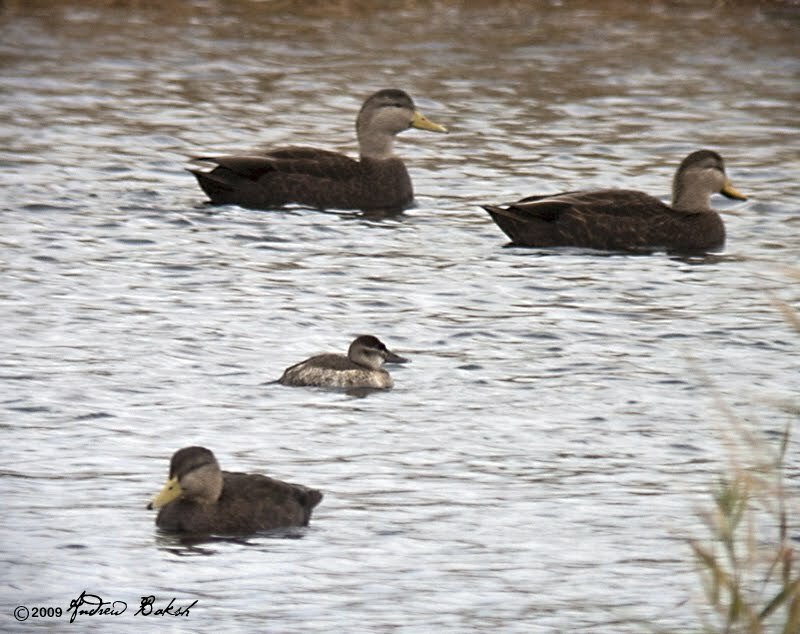 Soon we were joined by Shai Mitra and Patricia Lindsay who also got fantastic looks and further confirmed the ID of the bird. I then put in a call to Karlo Mirth (remember him from the Golden Plover find at JBWR), who had called me earlier about Black-legged Kittwakes being seen close in at Fort Tilden and relayed instructions on how to get to our location. In 20 minutes, Karlo was also enjoying excellent views of the bird. Later on, Tom Burke and Gail Benson, finally arrived - they had rushed back from a trip out at Sandy Hook New Jersey. They also got on the bird and got super looks of it as well. Another gentleman whose first name I got, Tom, but not his last name was also there and he too got on the bird. Huge, huge thank you to Shai Mitra, Tom Burke and Gail Benson who called and relayed the information I needed to get on that bird as quickly as I did. Lloyd Spitalink also deserves a lot of credit in getting the word out as quickly as he did once he got the report of the bird. 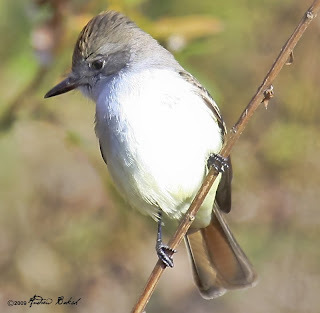 Ash-throated Flycatcher (Myiarchus cinerascens), is a rare vagrant to the East Coast. Recently, individuals have been turning up nearly every year, and have been found in all coastal states and provinces. Sightings are less frequent from inland areas in the East and Midwest. After some feedback (see the comments section below) I did some checking and the NYSARC report seem to indicate this would be the 5th such sighting in Queens NY if it is accepted. Bull's Birds of New York State pg 371. indicates that the first possible sighting in Queens could have been at Riis Park in 1978. Enjoy the photos! Additional photos of the Ash-throated Flycatcher will be posted to my Flickr account. Check back for a link to be posted soon. 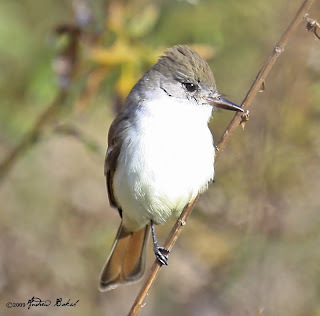 On Sunday November 1st, I decided to bird the barrier beaches of Long Island NY; the plan was to meet up with Shai Mitra and Pat Lindsay for a day of birding. 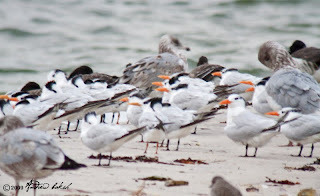 The coast guard station at Jones Beach was my first stop and I found myself very quickly trying to count a number of Royal Terns that I spotted on the spit. A few minutes into the count and observation, I was joined by several birders including Seth Asubel. Seth counted 33 Royal terns, 2 more than I had initially counted. 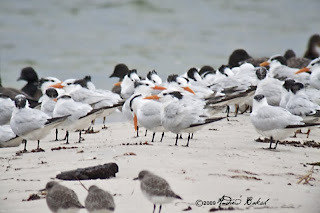 Shia and Pat soon arrived and Shai did a count of the Royal Terns getting 32, so we knew we were close. 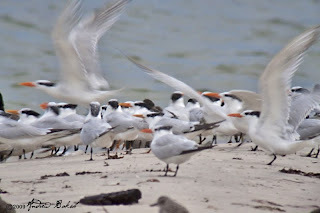 Before leaving the area the three of us did a final review and count and came up with 52 Royal Terns. 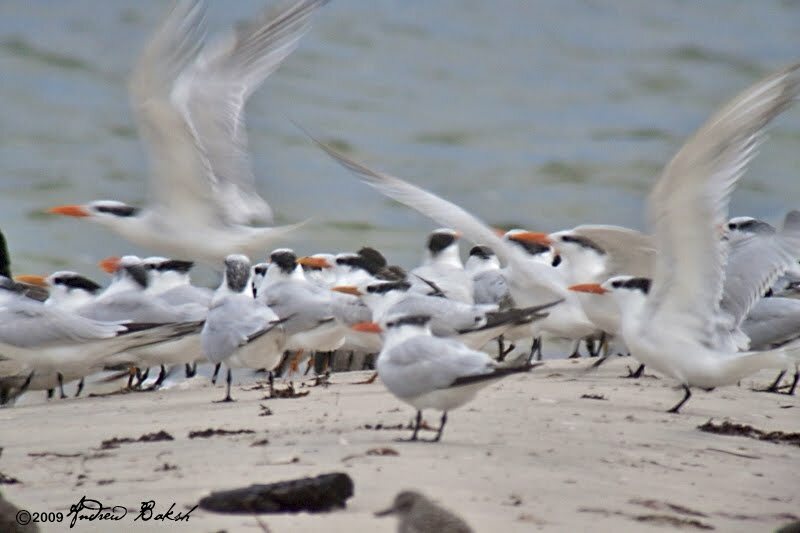 Later in the day, Shai, and I had two more fly by at Robert Moses that made our day total, 54 Royal Terns. 54 Royal Terns! The highest number I have ever seen. Shai, Pat and I soon left and together we birded other areas of Jones Beach. Our next stop was field six where we saw a massive flock of Dunlin, Black-bellied Plovers and Red Knots. We were also able to pick out a couple of Western Sandpipers and settled on what appeared to be a juvenile golden-Plover. The juvenile American Golden Plover had us going for a bit as the call sounded rather odd and had us contemplating Pacific Golden, as we heard it call a few times. Unfortunately, we were unable to lock onto the bird to analyze it further and so settled for AGP. Leaving field 6, we birded around Fire Island Inlet; here we found two Northern Shovelers, two Ruddy Ducks, and three Pied-billed Grebes in a freshwater pond - unusual to find on the barrier beach. Soon Pat departed and Shai later joined me at Robert Moses where we picked up 5 Snow Buntings in the parking lot. 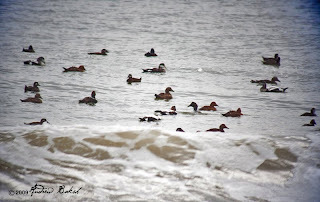 Out on the Ocean a steady stream of birds flew by including numerous Northern Gannets, Loons (Common and Red-throated), Long-tailed Ducks and all three Scoter species – Black Scoters were easily in the thousands. 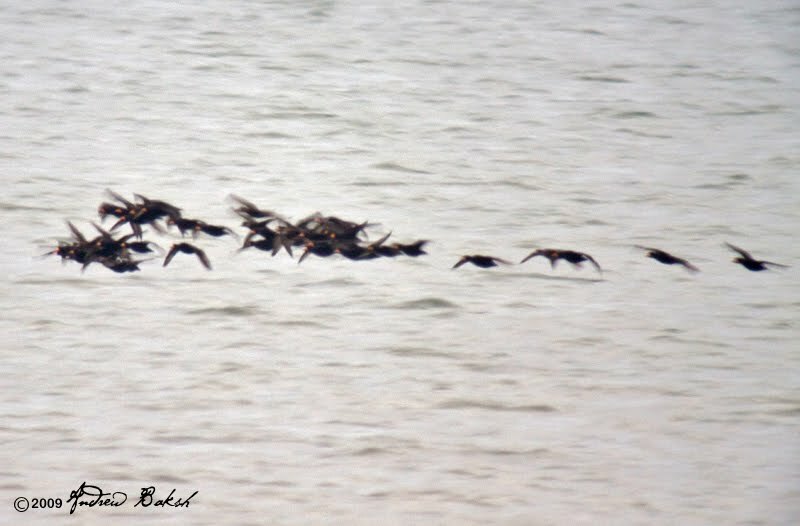 The numbers for Surf and White-winged Scoters were well in the hundreds. 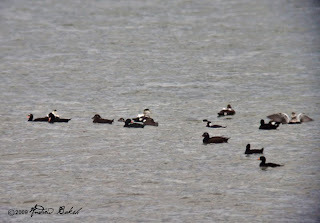 We also observed a high number of Common Eiders, with Shai estimating the number to be around 390. 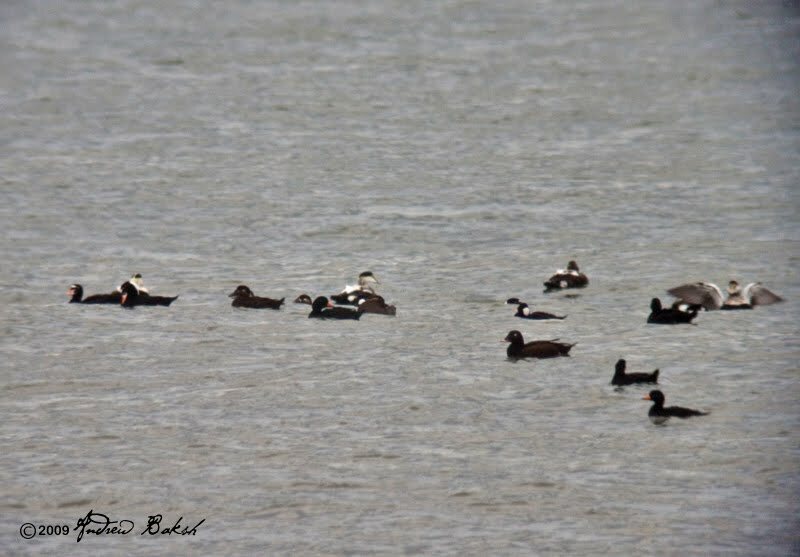 Another interesting observation was a pair of Lesser Scaup diving among the Scoters and Eiders. After awhile, Shai left and I continued birding until around 4:00 P.M. and then called it a day. Another fine day of birding the barrier beaches with Shai and Pat with the highlights being a high number of Royal Terns and Common Eiders. 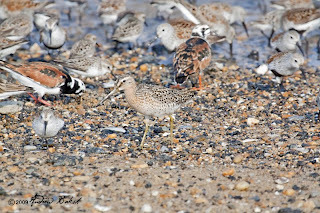 I had promised to help out Shai Mitra and Pat Lindsay with the NYC Audubon walk that was scheduled for October 11th at Robert Moses State Park. After clearing a mix-up with the National Park Service on a program that I was supposed to run at Jamaica Bay, I confirmed my availability. The walk was to begin sometime around 11:00 a.m. once the contingent from NYC had arrived. In my opinion, 11:00 a.m. is much too late to catch the morning birds, but that was the time this trip was scheduled. Anyway, there was no way I was going to begin my birding day that late so, I was at the Coast Guard Station at Jones Beach, by 6:55 a.m. where I met birders who were already there. Seth Ausbel, Tom Burke, Gail Benson and someone else whose name I did not get. 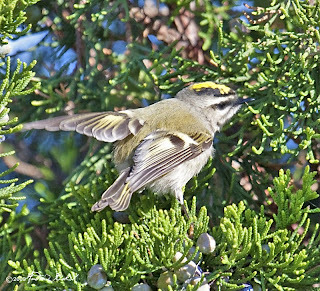 Together, we birded a bit around the Station, picking up quite a number of Kinglets – both Ruby and Golden Crowned, Swamp Sparrows and numerous White Throated Sparrows. Eventually, we all moved on to bird separate areas. I found myself with Seth and his friend while Tom and Gail headed towards the fisherman’s parking area. The birding was not bad, but the diversity was minimal; slowly, I added to my day list picking up Northern Flicker, Hermit Thrush, Yellow-rumped Warbler and others. 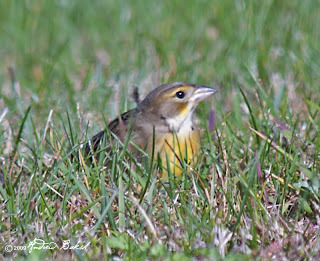 About an hour into birding, I got a call from Shai, who indicated that Pat had found a Dickcissel. Yes, there is such a bird as Dickcissel as there, is one called Titmouse...I am not yanking your chain. I passed the word to Seth and decided I would immediately convene to where Shai and Pat were located. On my way to my vehicle, I saw Tom and Gail and relayed the message only to find out that they had also gotten the call from Shai and were on their way as well. Tom and Gail waited for me and I followed them to the area where the Dickcissel was seen. When we got there, Pat and Shai were at the end of the strip and so Tom, Gail and I walked and birded heading their way. Along the strip, we again had a plethora of Kinglets, Chipping Sparrows and a couple of Field Sparrows. At one point, Tom and I heard the call of the Dicksessel, but could not locate the bird and after that one call we did not hear it again. We finally met up with Shai and Pat; by then, we were joined by two other birders, Ken and Sue Feustel. Shai stayed behind to speak with Ken and Sue, while Tom, Gail, Pat and I continued to backtrack where Shai and Pat had just left, in hopes finding the bird. We had gotten about half way down the stretch and Tom and I were parsing through some Sparrows, when Ken called out to us, they had found the bird. 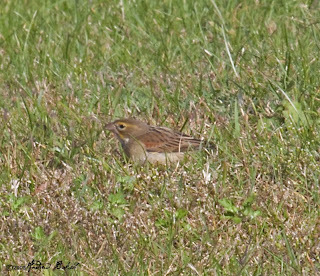 We hurried back towards them and spotted the Dickcissel feeding in the grass with some other sparrows. After getting our fill of the Dickcissel and pointing Seth and some other arriving birders to the location of the bird, Shai, Pat and I left to prepare for the Audubon walk. Shai rode with me while Pat headed off to get some sandwiches for herself and Shai. Me, I was pretty much prepared with my usual staple of PB&J packed sandwiches to carry me throughout the day. 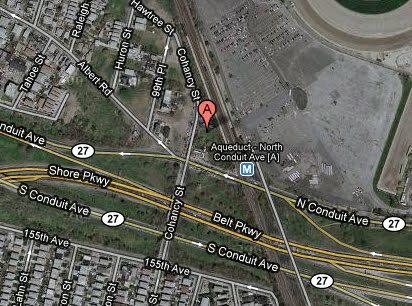 Shai and I arrived at Robert Moses State Park field 2 where we waited for the Audubon group. While waiting I went off and did a brief Sea Watch, which was not productive save for a few Northern Gannets way out. 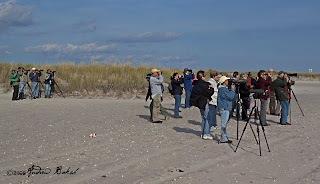 In about 15 minutes after arriving at Robert Moses, the bus with the NYC birders pulled into the parking lot. About 30 birders disembarked with their Audubon leader Joe Guinta. Shai went over to the bus, introduced himself and talked a bit about birding the barrier beaches. 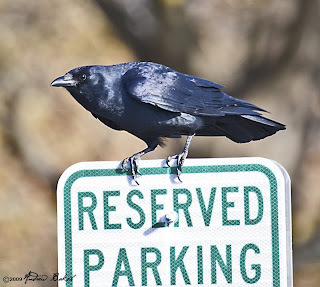 After Shai’s introduction we began birding the edges of the parking lot. It was much quieter now that it was almost 12:30 and birds were not easy to get. The first bird we got the group on was a Savannah Sparrow and everyone all got good looks. 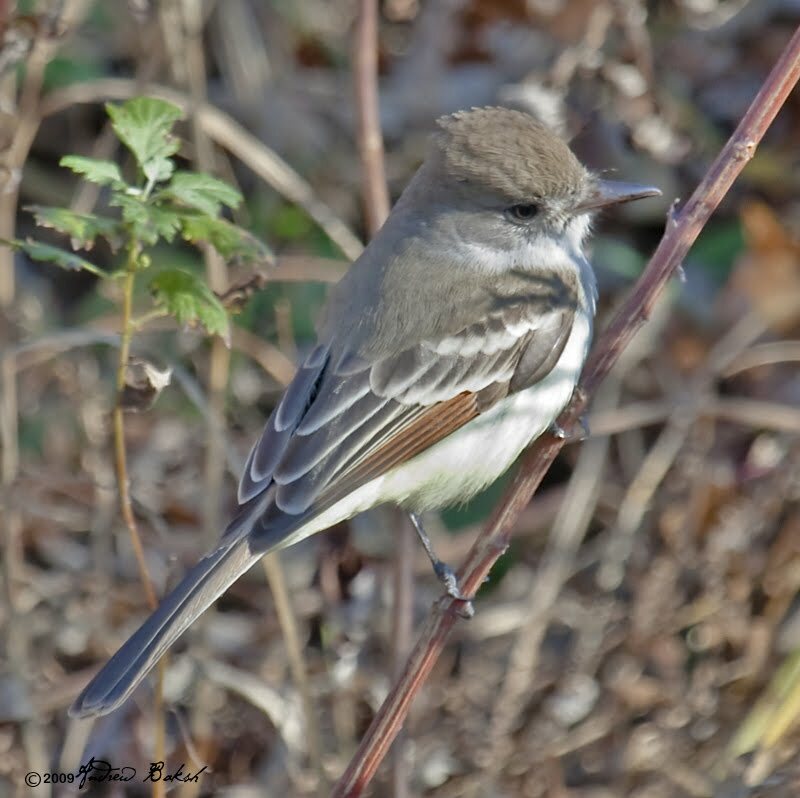 As we moved further along the central median, we picked up Dark-eyed Juncos, White-throated Sparrows, Northern Flickers, numerous Yellow-rumped Warblers and Eastern Phoebes. We also had a few flybys of one Merlin, a couple of Kestrels and 2 Peregrines. 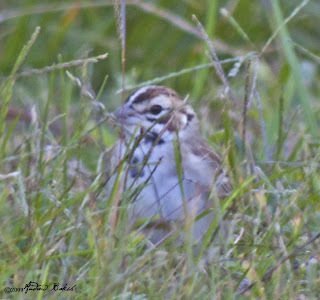 As we got closer to the Hawk Watch, Pat came towards our group and told me she had received a call from Tom Burke who had found a Lark Sparrow. I told Pat that I was going to join her if she was going for the bird. After speaking with Shai, I excused myself from the group and left with Pat. 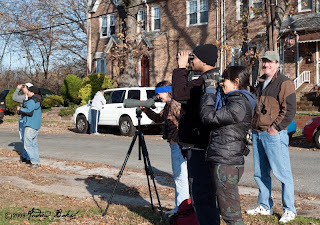 We arrived within 15 minutes at the location and saw Tom and other birders who were trying to relocate the bird. Pat, Gail, and I spoke to one local resident in the area and asked if we could walk behind the houses on the boardwalk. We were told that we could since it is accessible, to the public and so we began checking that section while other birders remained in the front. We had gone a few yards when I heard a familiar voice yelling, “I got the bird”…it was Bobby Kurtz. 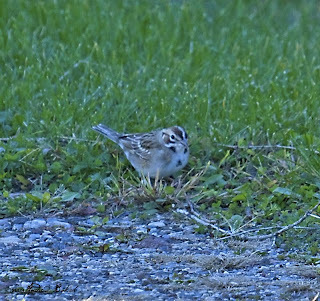 And sure enough, the bird had moved back to an area we had just checked and was feeding with some field Sparrows. We all keyed in on the bird and got great looks. 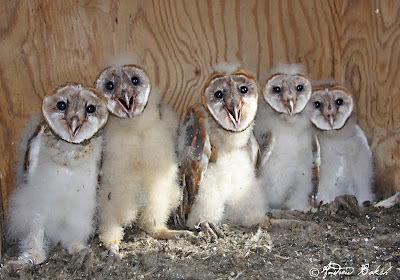 After a while Pat and I headed back to rejoin the NYC Audubon group. Along the way, I spotted Eastern Meadowlarks along the median and we pulled over, confirmed the ID and got some good looks. The group by now had walked the area around the light house and then headed to field 2. We joined them and did some more birding picking up another Eastern Meadowlark, Palm Warbler, another Sharp Shinned and many of the usual species. We wrapped up the walk with a brief Seawatch, where Pat and I saw Royal Terns, Black Scoters and Northern Gannets. It was hard to get people on the seabirds because they were moving fast and by the time you tried to get someone on the scope the birds were out of the field of view. At 4:30 PM, Joe decided that it was time to head back to NYC and so we bid the group farewell. After the group left, Shai, Pat and I did a little bit of birding then Pat and Shai decided to call it a day. 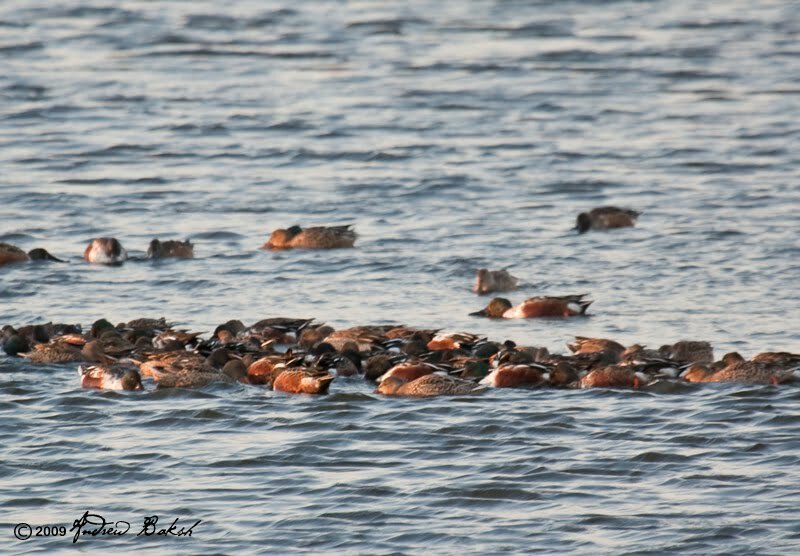 I headed back to Queens and birded Jamaica Bay Wildlife Refuge for a bit before calling it a day around 7:00 pm. 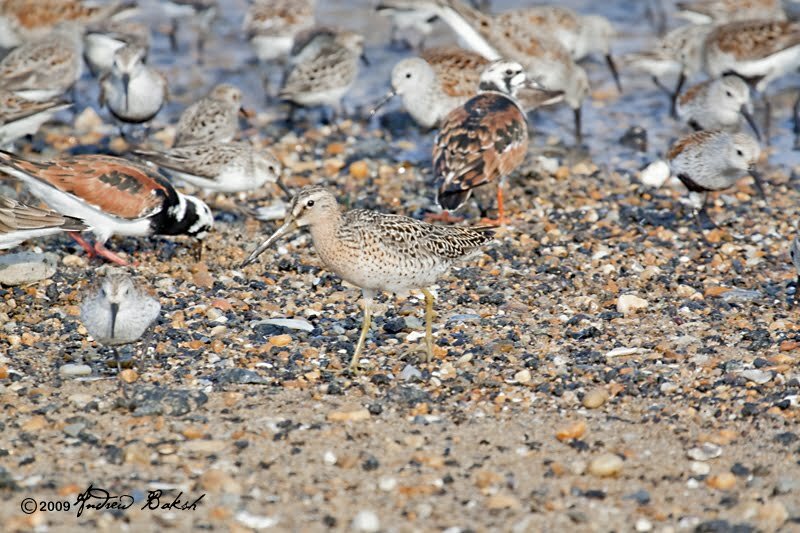 It was another good day of birding the barrier beaches of Long Island. 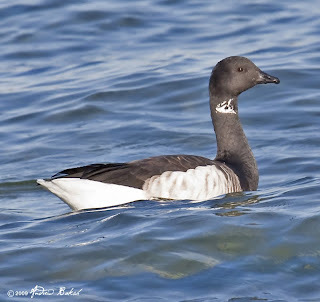 After birding three areas on Saturday, I decided not to make the run to Montauk, Long Island for the reported "Yellow billed Loon" and instead headed out for an all day vigil at Sunken Meadow State Park in Suffolk County, Long Island NY, in the hopes of landing the Pink-footed Goose. This bird, after a few days of no shows, was seen flying in around 3:10 p.m. on Saturday. 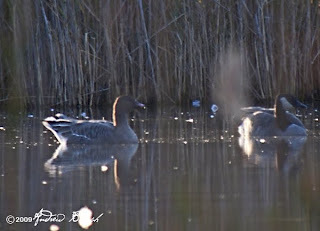 Birds, tend to stick to a pattern once established; however, I was taking no chances, so I got to SMSP around 8:45 a.m. and spent the day there birding and checking out every flock of geese that I came upon. The weather was nice and I birded the park picking up a few birds including my first of the season Purple Finch and a year high count of 56 Fish Crows. 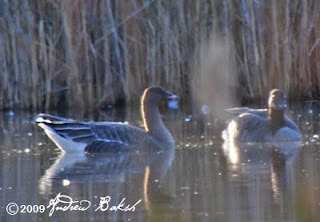 The Pink-footed Goose apparently stuck to its pattern and arrived on schedule flying in with a flock around 3:05 p.m.; that flock, also included the Barnacle goose that was reported with it a few days ago. 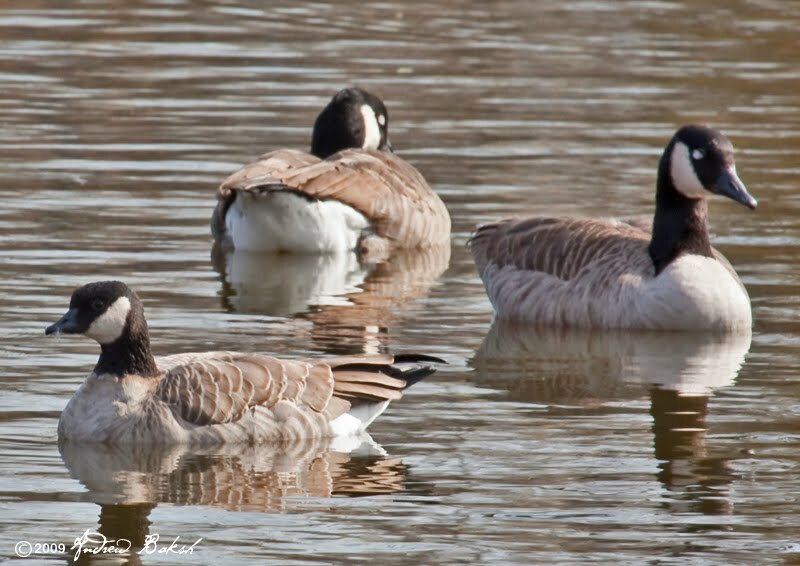 Having already seen the Barnacle, at Sunken Meadows on November 4th, I was focusing on getting the Pink-footed. 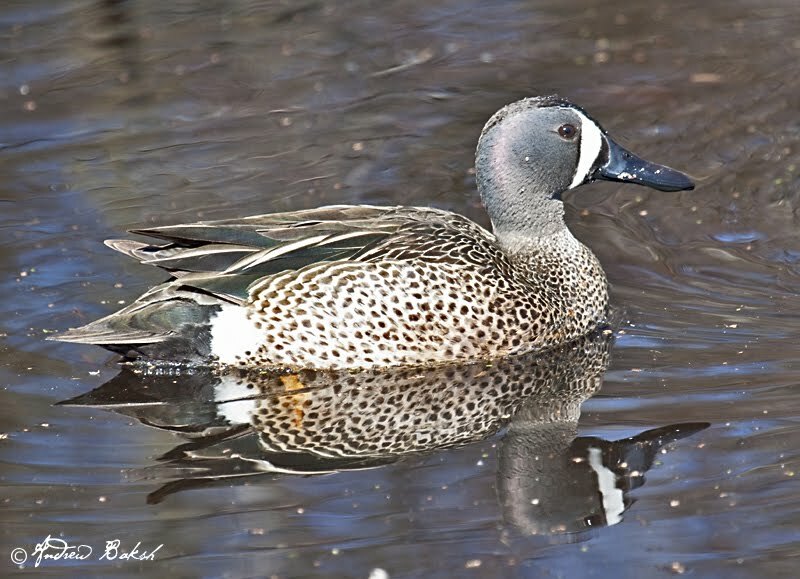 A group of birders from Ithaca spotted the flock when it came in and decided to try for looks into the creek as there was no view of the bird from the bridge once it landed in the creek. Thanks to Tom Johnson, I joined them and we headed north of the bridge over the creek, then walked about 120 yards west heading towards the golf course. Near a Park sign, we found an opening into the shrubs/wooded area and from there we walked to the edge. There was a slight opening that gave us a view into the back of the creek and it was there that we had looks at the Pink-footed and brief looks at the Barnacle. 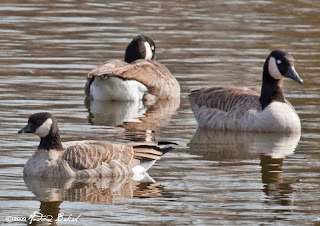 I called a few people on my cell who were in the park to get the word spread on where we were looking at the goose, but only one person, Claude Bloch, answered his phone. After several dropped calls and missteps, Claude found us and he was able to get on the bird. I think there were many people ruing not answering their phones that afternoon. 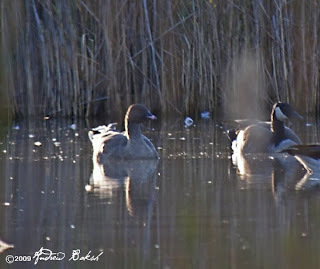 It was hard trying to get a decent photograph of the bird as the phragmites got in the way, but here are a couple of digiscoped ones. I am not sure how many Pink-footed have been reported in NY, but this species is considered a vagrant in North America, and should instead be in Europe. This makes it even more special!